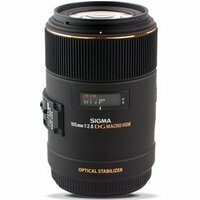 Suitable for full frame and cropped sensor cameras, the compact Sigma 105mm F/2.8 EX DG OS HSM Macro offers advanced close-up performance with true macro 1:1 magnification. The HSM (Hyper Sonic Motor) ensures quiet, fast autofocus, whilst the OS (Optical Stabilizer) allows close-up hand-held shooting. A 9 bladed aperture produces beautiful bokeh in out-of-focus areas. A lens hood is included.